Climate Change talk at the Bournemouth Fire Festival – Creative Dynamo Ecotainment! I’m just listening to my climate change talk for the first time the day after I gave it at the fire festival in Bournemouth. About 25 people attended but only half stayed until the end. 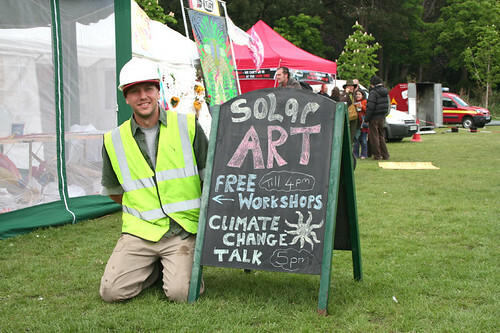 The talk was given in a solar powered art gallery at a free family one day event. It was advertised during the day on a blackboard outside the gallery and with a walk-about performance from 2 characters; myself ‘Dirty Ali’ and ‘Mammon’ the demon of greed. The walk-about promotion was the idea of the IFSOM (Independent Free State of Mind) gallery co-ordinator and was totally impromptu. Dirty Ali would approach and tell people at the festival where and when the talk will be BUT Mammon would then say it’s all lies and climate change is not really happening. Mammon’s point of view was that people should consume more and ignore what greens are saying ‘every purchase a prayer to me’ whilst Ali would stress ‘Reduce, reuse and recycle’. Giving the talk was made easier with the use of a template and some skills learnt at a workshop organised by COIN the Climate Outreach Information Network. I had adapted a lot of the material to suit my audience and style. The idea of giving the talk in character rather than myself was made easier as I work full-time at a recycling centre and already own the overalls and know some terminology. In fact Dirty Ali is a phrase meaning Alloy metals mixed in with other materials e.g an electric kettle is dirty alloy as it is both metal and plastic. I used 16 postcards with bullet points as prompts to help me deliver the talk as this was the first time and I had only rehearsed once. I knew it would take about 10 minutes for me to speak followed by the discussion. Although the discussion seemed like it would tail-off rapidly we actually ended up having quite a lively debate for 15 minutes and connections were made between ourselves and the local Friends of the Earth group. Unfortunately the audio recording does not capture what the audience was saying but I have para-phrased the questions below and tried to repeat / summarise where possible what was said ‘off-mic’. It turns out that artist Eric Impey (Mammon) also worked for the same company as me some years ago and knows the owner. Friends of the Earth are also looking for volunteers to go into schools and give talks / performances so this could be a joint project for us all. I really enjoyed giving the talk and making connections with new people. The event was also a trial run for the solar part of my renewable energy system CreativeDynamo. The system delivered about 40 watts of power from 8 pm to 3 am and consisted of lighting for the gallery and a public address system used for a poetry workshop, human beat-box and live music. Did anyone see that channel 4 documentary the great climate change swindle? Climate camp is an example of living and educating sustainably. You need to live it at www.climatecamp.org Climate camp did have an effect on the Dracs power station which subsequently reduced its output. How did my talk go? It would be better if we could hear you better. What can you buy at the recycling centre? Can the recycling centre provide a education centre too? What happens to the waste that does not fit in your wheelie bin? So what’s happening in schools then – maybe we could do a schools thing with Friends of the Earth and where you work? hippy with forked tongue, he lies, trust mammon,gold,diamonds, dishwashers with five year guarntee, alloy wheels an go faster stripes, these are a few of our favourit things. Hiya! thanx forda plug about my climate change art (found via google search) but I’ve had problems with ‘www.41dog.info’ I haven’t resolved yet! I’ve posted the relevent piccies there (as you’ve probably seen) and until I’ve sorted out my webdomain probs this’ll be a better place to go! I’ll let you know if this changes but hey! Muerto obligado for the unrestrained plus and what a pleasant surprise! Out the blue comes the fire and we better duck! Oh n me name’s ‘Steven J Humphrey’ as there’s only three of us in my head! ps: check out low carbon building trust for more of the same!! oh n my landline number is 01202 256691 – free for me to call your landline after 8pm!